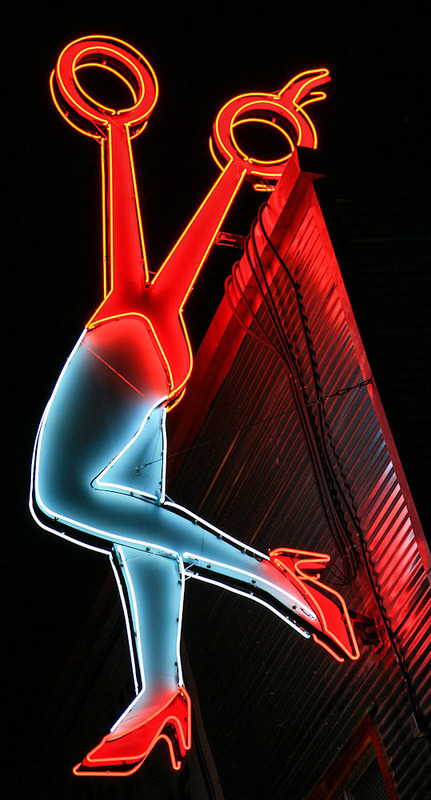 The Rip Van Winkle Lanes will certainly not put you to sleep. Especially after seeing this sign. The neon lettering catches the eye of passersby as they contemplate stopping by the Orange Bowl Lanes for a few games of bowling. This bowling alley is located in Kissimmee. 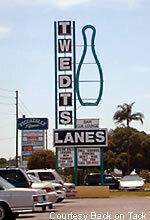 Check out this marquee for the Twedt's Lanes in Largo, FL. 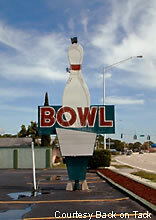 Twedt's has been a Largo bowling alley attraction since 1967. The sign itself has a giant pin that makes it real clear that you're about to reach the bowling alley. Unless it's mistaken for a giant milk bottle. See Roadside Peek's Lost Treasures Tribute to the Twedt's Lanes for more information. Twedt's and Ten Pin Lanes are both owned by the same company. They both have style... that is if you don't count the shoes. 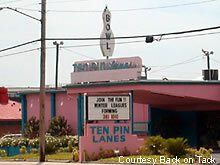 Check out the pink paint on this ten pin alley, located in South Pasadena, FL.